In March I'm holding 3 stamp classes....2 for Easter cards and one class on making journals or smash-type books. 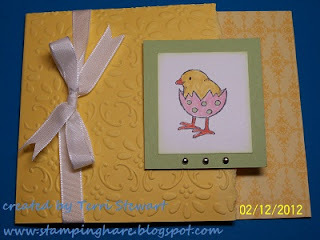 These classes are suitable for stampers of all abilities, so let's get stamping! 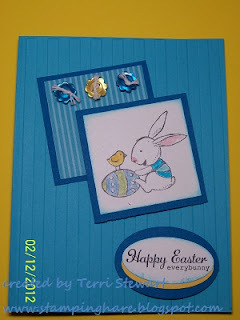 Make 4 cards, 1 each of 4 designs, includes envelopes (same designs from the March 3rd class); cost is $10. RSVP via email (terhare@hotmail.com or 410.647.4011). Space is limited, RSVP today! Check out this short video to learn more about smash books....I love this idea!!! You will learn how to create a personalized journal (or smash-type book) from a composition book. 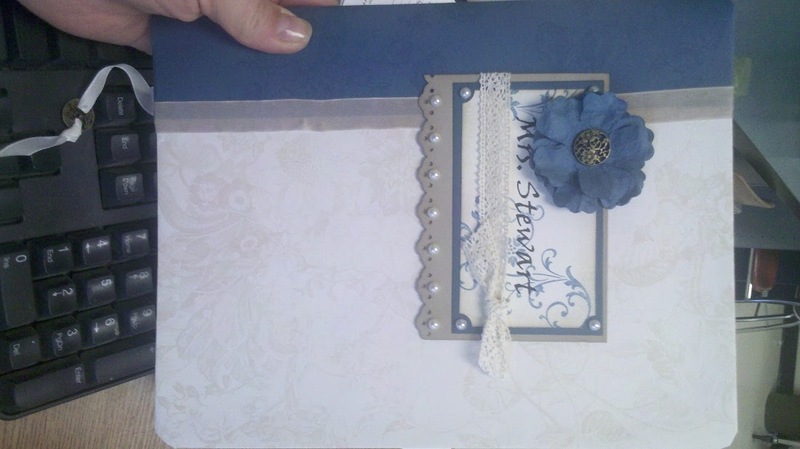 Cost includes 1 composition book, 1 package (consisting of 2 each of 6 double-sided designs) Designer Series Paper (DSP), and coordinating cardstocks and embellishments. 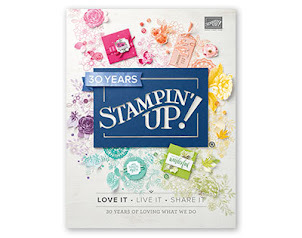 You will receive your choice of one package of $10.95 12x12" DSP found on the pages 184-186 of the 2011-2012 Stampin Up Idea Book and Catalog or the mini catalog (found on pgs 13 or 23); the DSP leftover from your journal is yours to keep for other projects---great for jazzing up pages in your new smash-type book! RSVP with payment and DSP selection by Friday, March 2nd. I have found a new Big Shot die that I am in love with...it's the scallop envelope die. 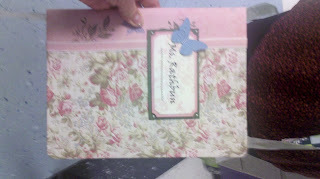 It makes THE cutest little envelopes. 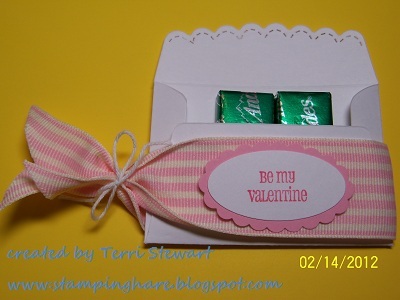 Perfect for giving little treats. I was hooked when I saw this sample posted by Filomena Green and then found a St Patty's Day treat made by Melissa Davies. 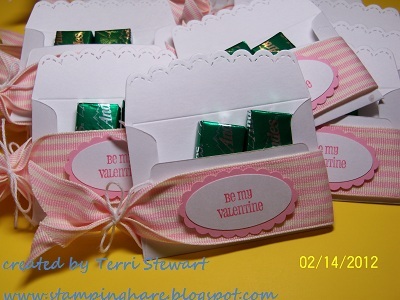 I borrowed the die from my upline and used it to make this little Valentine's treat for my coworkers--they loved it. Don't you think it's just too cute? 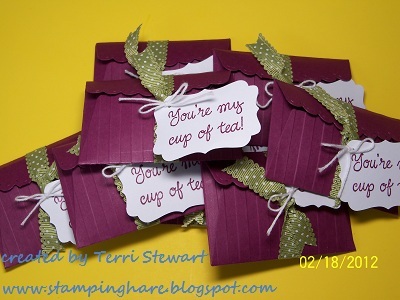 I used to the die again to make small treats to give to a group of my girlfriends when we treated ourselves to afternoon tea at Mary Anne's Theme Teas in Taneytown, MD. 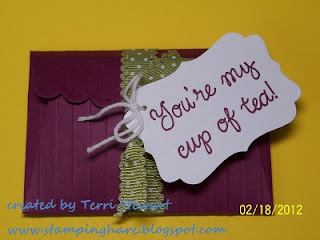 They were easy to make and just the right little something-something to share! I love stamping and sharing my creations with the wonderful people in my life! 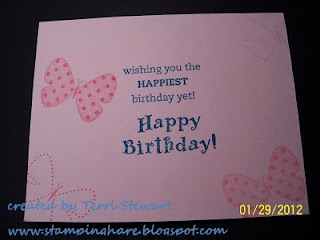 I had so much stamping news to share this post is a little long...but exciting all the same! 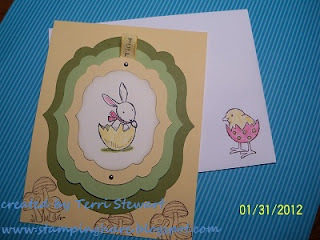 I am also planning 2 stamp camp classes; one for Easter cards and one to make journals. 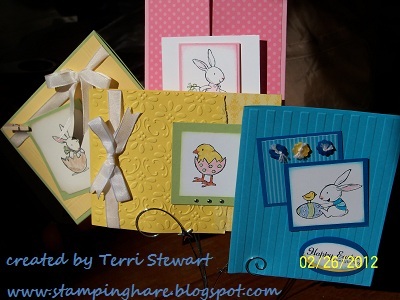 The Easter card classes will held on Saturday, March 3rd from 11am until 2pm and Friday, March 23rd 6 to 9pm; you will make 4 cards with coordinating envelopes using the Everybunny stamp set. 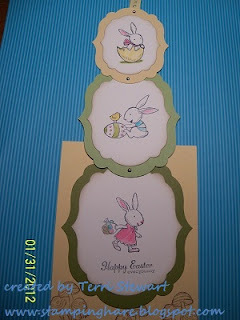 Attendees can choose from the following 3 designs; cost for this class is $10. 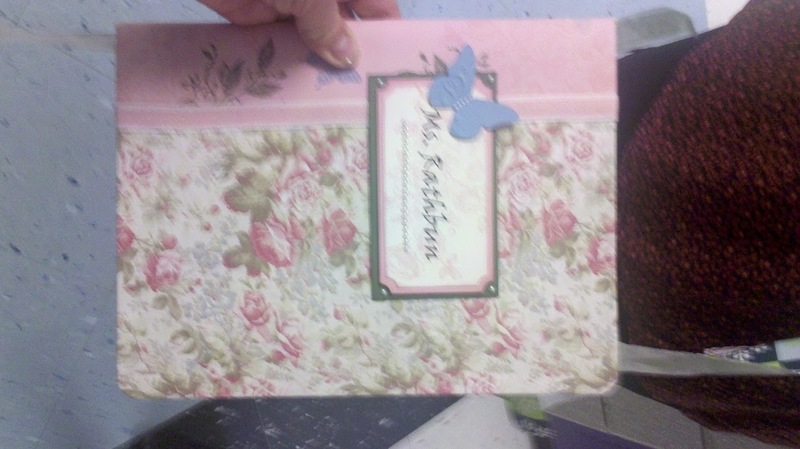 The journal class will be held on Saturday, March 24th, 2-4pm. The cost of this class is $20, payable by March 2nd to reserve your spot. If you buy the kit you are under no obligation to hold any shows, demonstrations, make minimum sales, etc--there are no strings attached! You get to choose which 4 stamp sets, 4 ink pads, and the cardstock you want in your kit; plus, many other stamping accessories are included. It's a great deal! Click here to learn more! 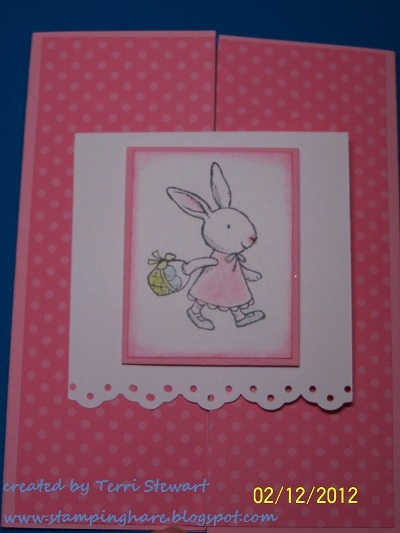 If you purchase the kit, stamp a few cards for yourself then do nothing else, you get to keep all the fabulous items in the kit. Did I mention there are no obligations, no strings attached of any sort? Don't forget Sale-A-Bration (SAB) continues through March 31st---for every $50 you order you recieve your choice of a FREE item from the SAB catalog. 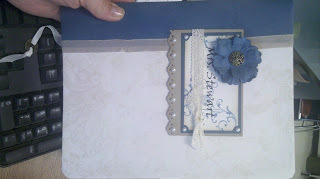 There's lots of FREE items to choose from---stamps, DSP, ribbon, cardstock, digital content, and more. Items from the online clearance rack can be used toward a $50 order!! Click here to go to my online store now. Consider holding a stamp party during SAB--hostesses enjoyed extra benefits and their friends get FREE SAB items with every $50 they order--it's a win-win for everybody! Call me today to discuss dates. The free trial includes the My Digital Studio Express software. This means full design functionality, access to Stampin Up print services, and the opportunity to purchase My Digital Studio downloads. You will be able to keep any downloads you purchase during the 30-day trial period. To get the free trial version, add My Digital Studio Express Trial (item 129600) to your online shopping cart at my online store, and then download and install it from your Download Manager. 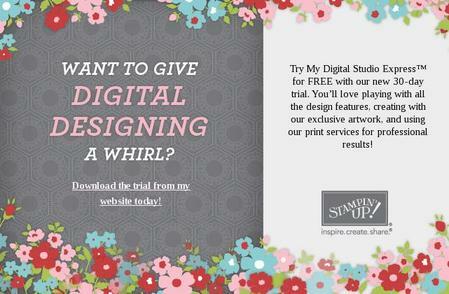 You can order the free trial by itself, or you can add it to an order with stamping supplies or digital downloads. If the My Digital Studio Express Trial is the only item you order, you will not be asked for any credit card or payment information. If you are a new customer, you will need to create an account. I've used the MDS software to create a family recipe book using scanned images of handwritten recipes. You can enjoy the software immediately---no need to read the how-to manual to start using the software if you don't want to and there isn't a steep learning curve. It's easy to use! I'd be happy to answer any questions you may have about the FREE trial or the software itself. paper, etc. Hostesses can earn special gifts and their friends get free Sale-a-bration products too with each $50 purchase--everybody wins! 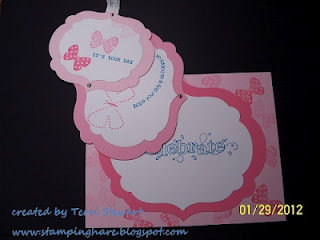 Call me today at 410-647-4011 to book your stamping party! 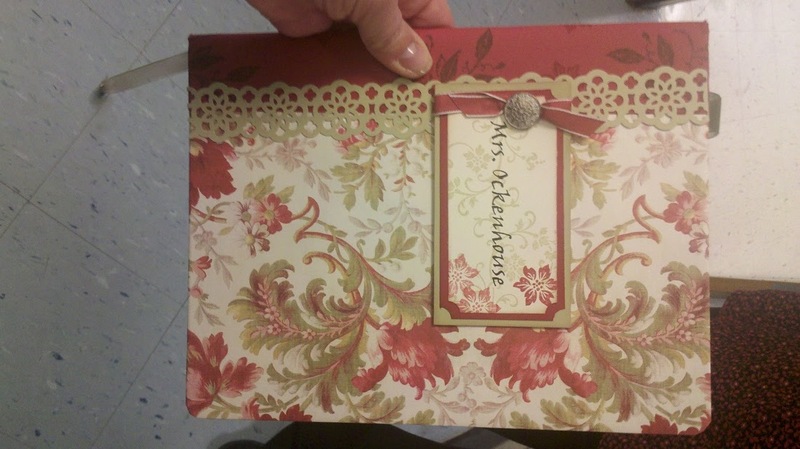 I hold a monthly papercrafts club at the local elementary school. 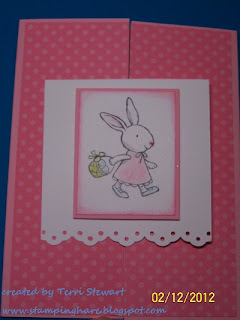 The kids have a blast making cards and other projects using cardstock and ink. 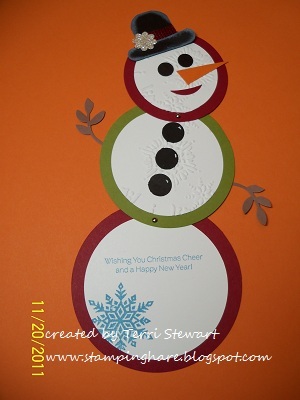 At the December meeting we made telescoping snowmen cards. 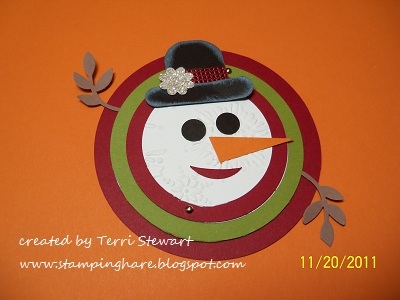 I assembled the cards and they put on the hat, face, buttons, and stamped the sentiment and snowflake. They always do a fabulous job. 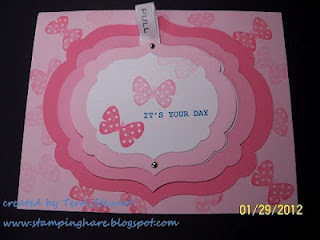 I saw this card on another demonstrators site (Becky Roberts); she had copied it from another demonstrator on the Stampin Up demonstrator website. 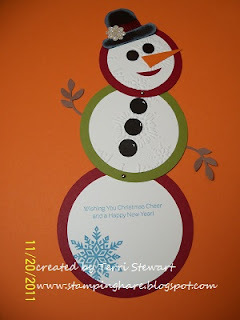 Once I saw it I couldn't wait to make these frosty gentlemen! I made a few of these card to share with my co-workers---they appreciated getting these unique cards along with wishes for a Merry Christmas! 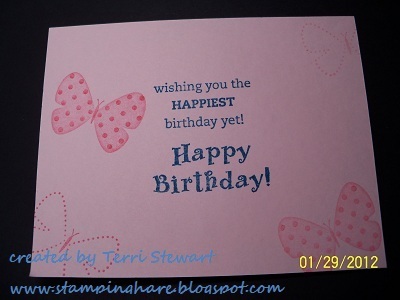 I used the same design for the remaining January birthday card I needed. 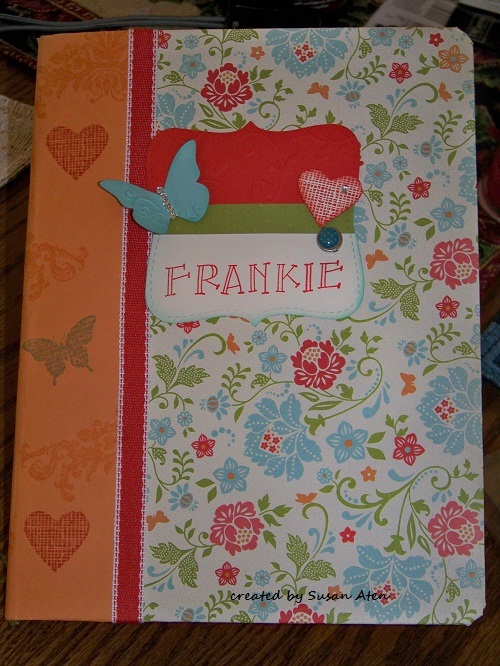 I couldn't wait to use my label framelit dies.... and had a fabulous idea to combine the telescoping card with the label die cuts. I think the result is a winner! 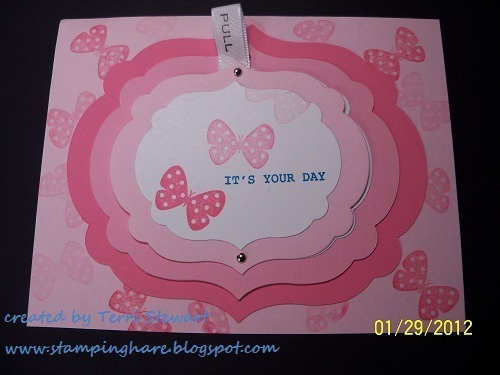 Labels: "papercrafts club" "telescoping" "birthday" "label framelit"